Earlier this week, we shared with you the proper way to maintain and care for your instrument when storing it for the season. We thought we would go a step further and build on that topic, by narrowing it down a bit, and providing answers to the questions we get from our beloved customers and that you very well may have at the moment. How do pH electrodes have to be maintained, cared for, and stored? Proper care for your instrument can extend the life of your instrument and improve your total cost of ownership. There are 3 major practices you can implement to ensure proper care of your pH electrode. Single-rod measuring cells and reference electrodes- electrolyte solution in the reference electrode should be used. 3 mol/L KCI solution must be used in gel electrodes. Glass electrodes: Pure measurement electrodes can be placed in a cap filled with deionized water. Do NOT place single-rod measuring cells and reference electrodes in deionized water, this can reduce the lifetime of the electrode. What if I have already stored my pH electrode dry? If you have incorrectly stored your pH electrode dry, place the electrode in a solution as mentioned above for at least 24 hours before its first use to rehydrate it. Test the electrode by calibrating prior to your first measurement. Dirt deposits of any kind on the membrane surface or the junction of your pH electrode may reduce the lifetime of the electrode, and cause it to provide inaccurate readings. It is best to clean your electrode chemically and not mechanically. What do I do if my electrode has dirt deposits outside of the electrode and the junction? Inorganic adhesions - Put the electrode for a couple of minutes into 0.1 mol/L HCl or 0.1 mol/L NaOH. If build up still persists, the solution can be heated up to 50ºC (122ºF) before the acid or alkali concentration are increased. Organic adhesions - Rinse the electrode with organic solvents. Wipe the membrane gently with a damp, lint-free soft cloth or Kimwipe. Proteins - Place the electrode in a pepsin/HCl solution for a minimum of 1 hour. Sulfides - Store your electrode in a 7.5% 0.1 mol/l HCl solution until the discoloration on the junction has vanished. After cleaning, rinse the electrode with deionized water and place it in the electrolyte solution for a minimum of 1 hour. Be sure to recalibrate the electrode before taking your next measurement. How do I clean the reference electrode with liquid electrolyte? To clean your reference electrode, using liquid electrolyte, remove the old electrolyte and replace/refill it with new electrolyte. Repeat this process until dirt is removed. If you find KCl crystals in the interior of your electrode, heat the electrode in a water bath at 45ºC (113ºF) to dissolve the crystals. After the water bath, replace the old electrolyte with new. OK, you know how to store your electrode, you know how to clean your electrode, now we'll look at some general tips and key take-aways to ensure you get the most out of your pH electrode. After each measurement, rinse your electrode immediately with deionized/distilled water and store as recommended. Routinely inspect your electrode for dirt deposits on the membrane surface, junction and the interior. Taking measurements in aggressive or hot environments will reduce the life of your electrode. 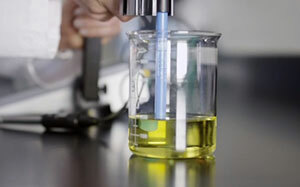 When using electrodes with liquid electrolyte, the filling opening must be opened during the measurement and calibration in order to prevent a back diffusion of the sample by the electrolyte flow. The refilling opening must be closed when stored and in between measurements. Do not use deionized water as storage solutions for most sensors, this will reduce your electrode's service life. NEVER store the electrode dry.